Do you use Soundslice with other people in your company/school/group, sharing a single Soundslice login across multiple people? We’re here to help. Instead of sharing passwords — an icky and insecure practice — you can use our organizations feature. With it, each of your colleagues logs in with a separate Soundslice account. Then, to access your shared slices, you simply “switch into” your organization’s account. You can switch back and forth, and you can copy slices between your organization(s) and personal user account. If you’re familiar with Facebook Pages, you’ll feel right at home. This works the same as Facebook’s “Use Facebook as [page]” feature. NOTE: Organization accounts are only available to people with a Teacher or Licensing plan. Coming soon! For now, the only way to create an organization is to contact the Soundslice team. Make sure the user has a Soundslice account. It doesn’t have to be a paid account — a free account is fine. Make sure you have administrator privileges in the organization. Switch into your organization’s account. Enter the email address with which the user registered for Soundslice. If you want the user to have administrator privileges, check the box. Submit the form, and you’re done! Under “Organization members,” click “Remove” next to the user you want to remove. Confirm on the next page. To access an organization that you belong to, first log into your personal Soundslice account. Click the organization you want to access, and you’ll instantly be using Soundslice as that organization. At any point, you can use the same process to switch back to your personal Soundslice account. In the slice manager, you can move slices — and even entire folders — across accounts. For example, you can move a slice from your personal account into an organization, or vice versa. Hover over the slice title in the slice manager, and click the “Move to folder” icon. You’ll see all the folders in your account, plus a list of your organizations at the top. Click the organization to which you want to move the slice. Then select the folder within that organization (or “Top level”). Click the folder in the slice manager so that you’re viewing its list of slices. Click the “Move folder” icon at the top of the page, next to the folder name. Select the organization to which you want to move the folder. Then select the folder within that organization (or “Top level”). Each member of an organization either has administrator privileges or not. View and edit the organization’s member list. Add new members to the organization, including new administrators. View and edit the organization’s payment information, including the ability to cancel the account. Edit the organization’s profile photo. If you’re worried that other people in your organization will edit a slice (its notation or syncpoints) while you’re working on it, you can temporarily move it into your personal account. This will prevent anybody else from altering it. When you’re done editing, move it back into the organization. It’s totally fine for multiple people in an organization to be making edits to different slices at the same time. This includes syncpoints, recordings and the notation itself. Syncpoints and notation are stored separately in our system. That means one person in your organization can work on syncpoints, while another person works on notation — even for the same slice at the same time. 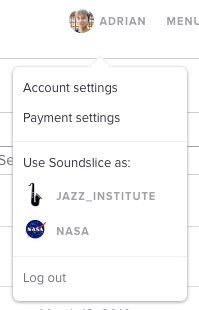 Your Soundslice payment details are stored in the organization itself, not in any of the individual user accounts. If your account has embedding privileges, the privileges are in the organization itself, not any of the individual user accounts (unless individual user accounts are also paying for embedding). Likewise, if you use a domain whitelist for embedding your organization’s slices, that whitelist is in the organization account. An organization can also create courses. An organization doesn’t have its own password; it’s accessed solely through its members’ user accounts. Questions? Get in touch any time!